Hello! Today I have the second day of our spring vacation to share with you. On day one of our vacation we visited The Gateway Arch in St. Louis, and the Missouri Botanical Gardens. After our visit to the gardens, we drove five hours to Memphis, Tennessee and after a nice dinner and a relaxing night at our hotel, we visited Graceland: the home of Elvis Presley, the next morning. Now first of all I must share with you that I'm not a Elvis Presley fan. I have always admired him for his lovely voice and beautiful appearance. I always thought he seemed like a nice guy and I loved his smile and the mischievous look he'd always get in his playful eyes, BUT, I've never owned any of his music or even listened to it on the radio. He was probably more of a star in my parent's generation; I remember him more as a movie star because when I was a little kid I would watch his movies on t.v. I remember the day he died because it was such a big news story, and I remembered being very surprised at how the public was reacting to the news of his death. But that is it. That is all I really remember of this famous celebrity icon. That being said, I didn't think our visit to Memphis would be complete without visiting Graceland, so off we went. Here I am standing at the entrance to the grounds. Once inside, they did allow you to take pictures which was really nice since most places I visited on my trip did not allow pictures to be taken inside. Guests are given a head set to listen to as you view each room which tell how the room was used and many personal stories from Lisa Marie and Priscilla are shared. This is the first room you see when you walk in the door. It is the formal living room. I loved the peacock stained glass and all the white furnishings. A music room is on the other side of the formal living room. There is a lovely fireplace with a mirror above it in this room. And another big mirror on the opposite side of the fireplace above the sectional. There were many beautiful family photos in this home. This is one of Elvis, but there was also a lovely one of Priscilla and Lisa Marie, and also his father. 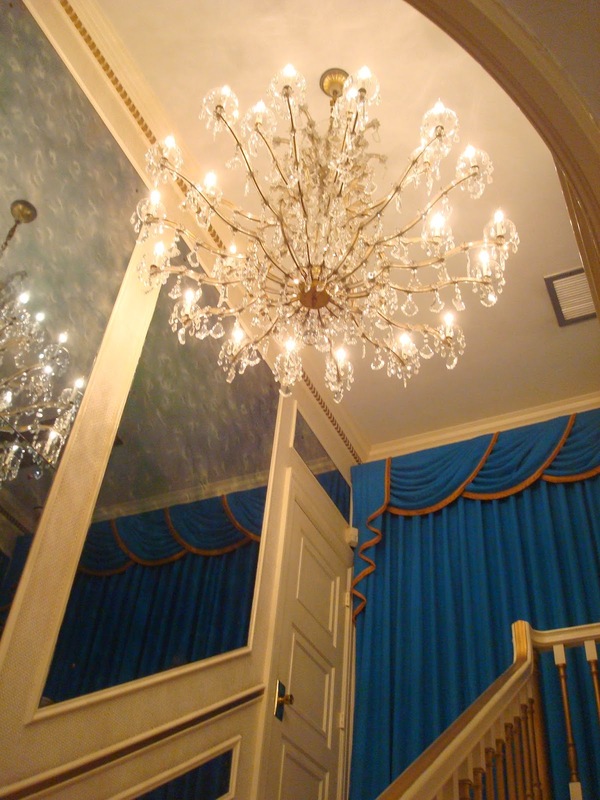 This is a gorgeous chandelier above the staircase that led to the second floor, which you are not allowed to see on the tour. We were very disappointed that we were not allowed to see the upstairs, but we understood why. It was Elvis's private quarters which he liked to keep separate from his guests, and it was also the place where he spent the last minutes of his life. Elvis had a very close relationship with his parents and they lived with him. This was their bedroom. The kitchen was very dark with a lot of dark paneling, so I couldn't get any really good pictures no matter how hard I tried, so I don't have any to share. One thing that really struck me about Graceland was how it seemed to be a living time capsule. We've all seen 'dated homes' before: you know: Granny's house that has dated furnishings and wallpaper, with a mix of new items; but I've never seen a home so perfectly stuck in time before. It was beautiful, and it brought back a lot of memories from my childhood. It was filled with old t.v. 's from the 60's, dark paneling, old phonographs and record albums. The kitchen had the gold, green and orange colors so popular in that time period, and when I shared my pictures with my daughter, she remarked how so many of these styles are now coming back into vogue again. This is Elvis den, or what we would call a 'man cave' now. It had a large sectional, and was filled with record albums, a bar, and had three television sets on the wall. We learned on our tour that Elvis loved to watch television, and he had a t.v. in every room of the house. This is the billiard room which had fabric on all four walls and the ceiling. The same fabric was even on the furniture. It was very interesting. The strangest room in the house was just off the kitchen and was called 'The Jungle Room'. There was a water feature on the left wall (pictured below), again, it was a very dark room so it was difficult to get a good photograph. All the furniture had claws or animal fur/skin on it. The chair in the corner with the panda on it was Lisa Marie's favorite place to snuggle with her father. When you leave the house, you then exist onto the car port and into a separate building which was Vernon's office. Vernon was Elvis father and manager. A video of Elvis is playing in the background, which shows him seated at this very same desk and giving an interview. Elvis loved horses and had several on his property. They still keep horses on Graceland today. This is the backyard of Graceland. 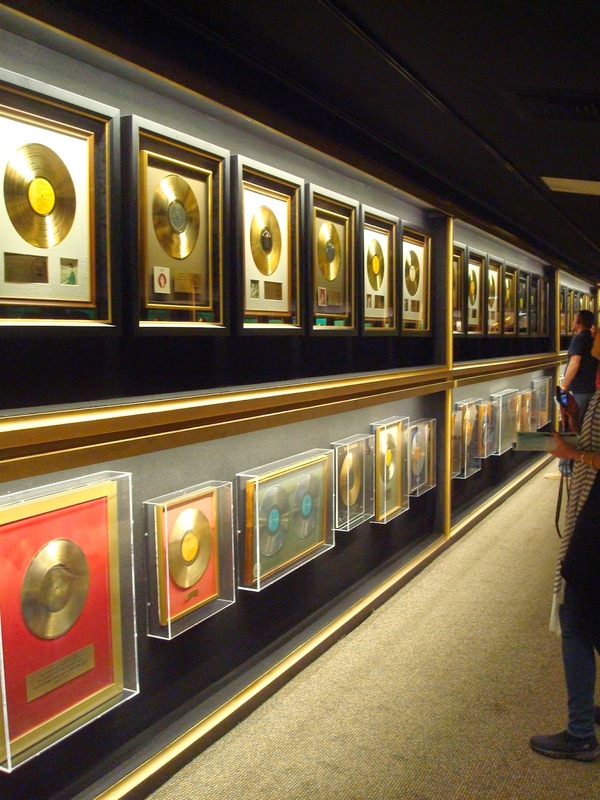 There was one wall that held all his gold and platinum records. I took pictures of a few songs that were my personal favorites. 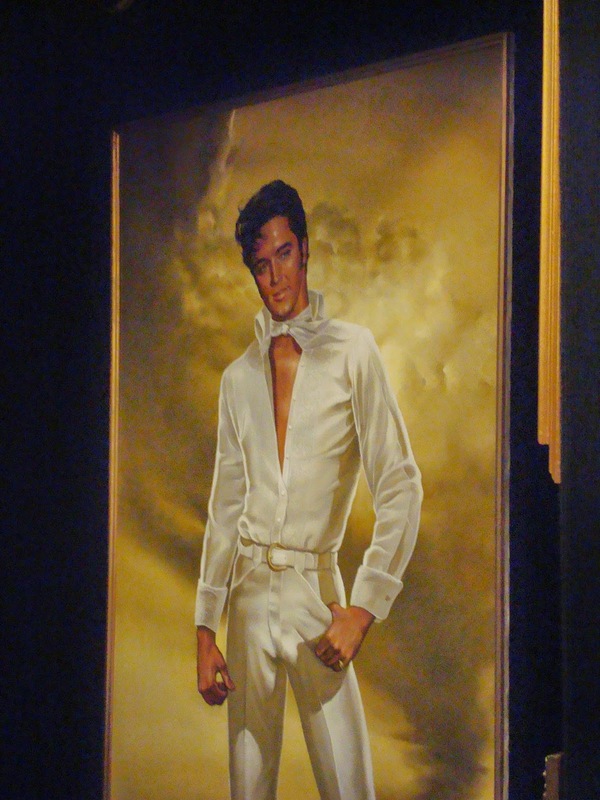 I loved this painting of Elvis. This is a display of Priscilla's wedding attire. 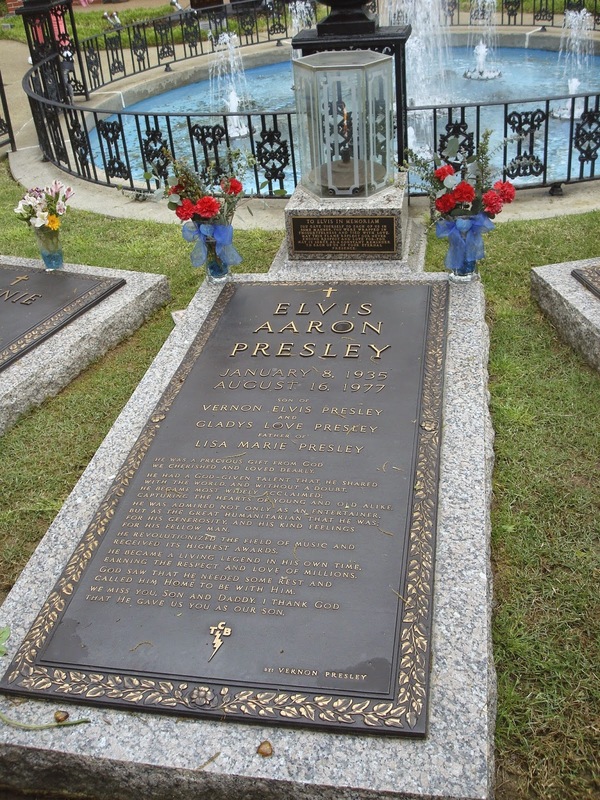 To our surprise, guests spent the longest time at the grave of Elvis. We had to wait quite awhile before it was our turn to view the grave and read the tombstone. It's been about thirty seven years since Elvis passed away, and people were still crying at his grave. The mansion was still crowded with visitors, and we heard accents from all over the world. This is the outside of the home. Although it is a very beautiful home, it is actually very modest in comparison to how current celebrities live today. I remarked to my husband that we have friends that have homes nicer than this, and it just shows one how much our standard of living has increased over the past thirty years. After you exit Graceland, there are countless museums and gift shops to visit. It is almost overwhelming, because there is so much to see and read. There is an entire museum just devoted to how much Elvis enjoyed 'playing' and it shared video's and stories of him with all the cars and little toys he collected and used. They also have two of his airplanes on display which you can go inside of and hear more stories of how he used the planes. We probably spent the entire morning at Graceland, and still didn't read or watch every display and video because there was just so much to see. When we ended our tour of Graceland, I was surprised at how much the experience moved me. I didn't know quite why. Was it perhaps he had such an amazing life and touched so many people? Was it because he died so young, and I wondered what would have happened if he would have lived a normal life span? Was it because he possessed everything the world had to offer, yet still was addicted to prescription drugs and died such a tragic death? Was it hearing all the touching family stories from his daughter and ex-wife, and seeing how much love he had for his family, yet knowing it all tragically fell apart in the end? Was it because I remember him as a handsome young man on television and all his music is familiar to my ears and brings back many, many, childhood memories. I don't know exactly. I only know that although I wouldn't consider myself an Elvis Presley fan, I was still moved by my experience at Graceland and I was very happy I went to visit. And I recommend to anyone, that if your ever in Memphis, be sure and visit Graceland. You won't regret it. Tom and I have been there twice! I love seeing all your vacation pics! You look lovely and I am so happy for you and Todd to be enjoying all this time together! Hope to see you soon! Reading your post gave me goosebumps. Graceland has been on my places to visit list for a while now. I don't know why, but in the recent years I have been really enjoying his music, although I never really listened to it when I was younger. He was one of the performers I wish I could have seen live, but I was only 1 when he died. Thankfully there is Youtube. I visited Graceland about 25 years ago and I cried at his grave, he was my first love even though I was in elementary school at the time. Thanks for the pictures they brought back memories. Wonderful post Amy, thanks for all the fun pictures. 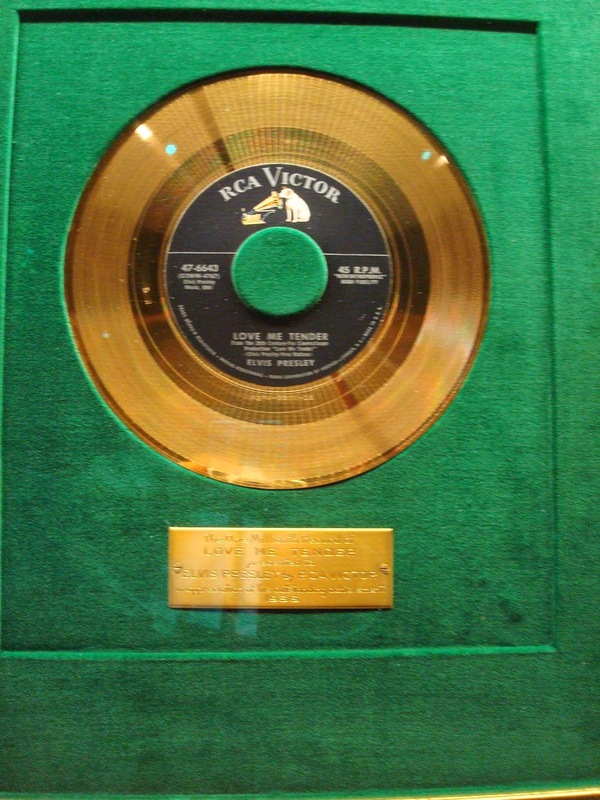 I've been to Memphis twice and never visited Graceland...I think I'll have to visit it next time. Looks like you're having an amazing Spring vacay!